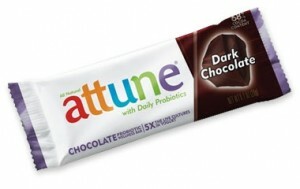 Probiotics- I know I eat these in my yogurt everyday. But ever think of having them in granola? 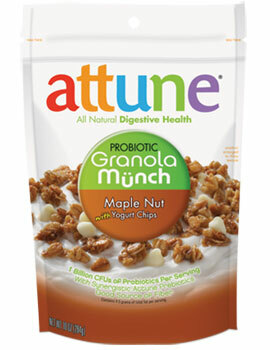 So, the nice folks at Attune asked if I wanted to try a bag, and I opted for the Maple Nut variety. Of course, it was hard to choose, all three sound SO GOOD!! Once I got my bag in the mail, I opened it up. The Maple Nut flavor has pecans and yogurt chips, but looks like oats for the most part in the bag. I think mine may have melted a little bit one the way to my house, because instead of yogurt chips, I sort of had yogurt chunks. Either way, it was absolutely DELICIOUS! Honestly, this is one of the best granolas I have ever eaten. 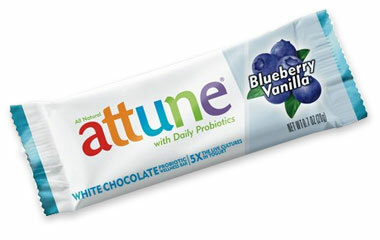 The yogurt chips tasted like a sweet, white chocolate with hints of vanilla, almost tasting like vanilla frosting. The oats were crunchy with a nice maple syrup flavor, that was both sweet and buttery tasting. 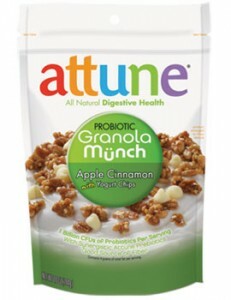 I definetely agree with the “Munch” aspect- I could munch on this granola all day long!! 1 serving, 1 oz., is 120 calories, 4.5 grams of fat, 20 carbohydrates, 3 grams of fiber, 6 grams of sugar, and 2 grams of protein. Rolled oats, brown sugar, yogurt flavored chips (sugar, palm kernel and palm oil, skim milk powder, yogurt powder, demineralized whey, soya lecithin [an emulsifier], lactic acid powder, vanilla extract, salt, freeze-dried lactobacillus acidophilus [a probiotic]), soybean oil, high fiber brown rice crisps (rice flour, rice bran, rosemary extract), fructan (a dietary fiber), chopped pecans, natural flavors, dextrin (soluble fiber), salt, caramel color, rebaudioside a (stevia).